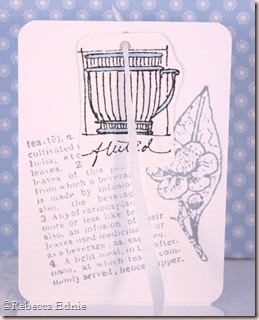 Another ATC swap. I’ve actually done quite a few Swap-Bot swaps since I posted my last one. Between swaps and getting ready for Clear Dollar Stamps Sneak Peak projects, I’ve been really busy! So fair enough, not very interesting. 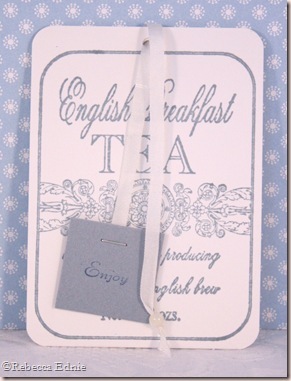 I wanted the little ‘enjoy’ tag to look like the little thingie that hangs off tea bags. It opens up! That’s why the other end of the ribbon had a bead on it. So the ribbon doesn’t come through the hole at the back. 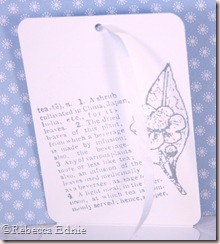 You can see the stamped ‘charms’ hanging off the ribbon at the back. 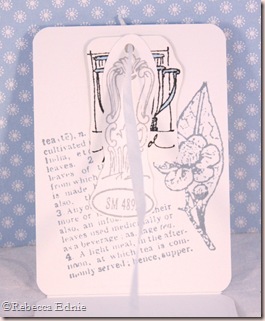 Now you can see the tea cup behind the spoon handle. Stamps: all Stampington except ‘enjoy’-SU! Hi rebecca! my name is sue and it's so nice to have you as part of the CDC team! Welcome! 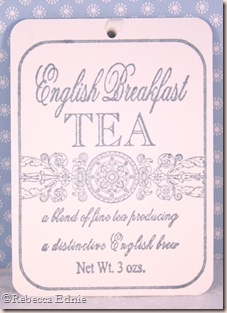 it makes me think of a blue and white vintage tea cup! you know i love those stamps too! i keep meaning to check out swap-bots.i joined a really cool swap – you might like it too – see my sidebar for the link to all the info if you are interested!